You’re closer than you know to becoming the person God wants you to be. By His enabling grace, you’ll make it through this trial and come out stronger and wiser. Paul says, “If God is for us, who can be against us?” (Ro 8:31 NKJV). God is for you! That means you can do the thing you are afraid you can’t do. The prison bars you’re beating against are in your mind. And since you put them up, with God’s help you can take them down. God wants to set you free from the fearful attitudes that have held you back for so long, to release you to live up to your full potential. The right attitude can overcome almost any barrier. For example, the Bible says, “Love never fails” (1Co 13:8 NIV). Why? Because love isn’t dependent on your emotions or circumstances, it’s a servant of your will. Love is a decision! Jesus said, “This is my commandment, that ye love one another, as I have loved you” (Jn 15:12). And if Jesus commands it, He will enable you to do it! Beginning is usually the hard part. The journey of a thousand miles begins with a single step; after that it gets easier. But look out—old attitudes will try to resurface and come back stronger than ever. Don’t let them. So be patient. It will take time to get there, but anything worthwhile is worth working for! Yes, you might be hurt or embarrassed—so what? To overcome insecurity and gain confidence you must allow yourself the freedom to take a chance. Get over your obsessive need for approval and acceptance and learn to laugh at your mistakes. We’re all human; stop taking yourself so seriously! You are not the center of the universe, and your little faux pas don’t mean that much in the bigger scheme of things. Besides, mistakes are often better teachers than success. When you complete a project, reward yourself. When you take advice or correction without retaliating, reward yourself. Often the people we lash out at, are those trying the hardest to help us. Get used to the idea that you’re valuable, talented, and skilled, and your worth in God’s eyes is inestimable. Stop scrutinizing yourself through distorted lenses and start seeing yourself with 20/20 vision. Once you can do that, your fears will be replaced by confidence in yourself and in your future. A few weeks ago I took a mini-vacation down to my favorite area of Florida, Seagrove Beach on beautiful 30A. I was anxious to get my paddle board out on the beautiful emerald waters of the Gulf of Mexico. But, the beach’s warning flags told me I should re-think my plans. There was a purple flag indicating dangerous marine life, and a red flag indicating high hazards and strong currents. So, I improvised. 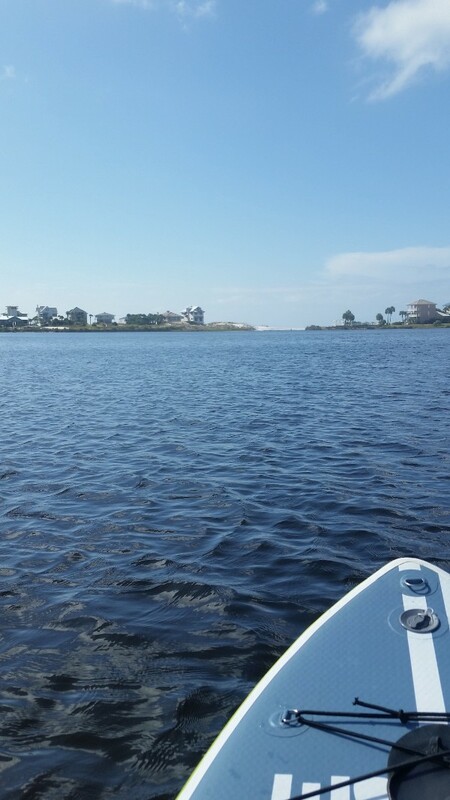 I took my board out on Eastern Lake, a rare coastal dune lake that runs under Scenic Highway 30A and eventually feeds into the ocean after a heavy rain or other inflow. Because it is a coastal dune lake, Eastern Lake is rather small. And since there hadn’t been a previous heavy rainfall to create an opening to the ocean, the sandy beach served as a barrier between the lake and the ocean. I paddled from the beach end (the south end) of the lake where the salt water mixes with the fresh, to the marshy north end where I’m sure some alligators make their home. It was only about a mile and a half from the beach barrier to the marsh end of the lake. Needless to say, for someone who is used to paddling on rivers that run for hundreds of miles, I felt a bit trapped. And unlike the ocean, I didn’t have a wide open space to explore. All I could do was just keep paddling in one big circle around the perimeter of the lake. Despite all the beauty surrounding me and the change of scenery from my regular paddle route, the feeling of going around in circles made me frustrated. The experience of feeling trapped is one I’ve felt more than once in my career. Whether it was when I was trapped in a toxic office environment, or when I was restless because I wasn’t working in my purpose. It’s not a fun place to be, at all (I’m sure you can probably relate). When faced with these situations, I’ve used various coping mechanisms that have led to changes in my situation for the better. My paddle around the lake that day reminded me of all the possible ways to cope when faced with the feeling of being trapped in your career. 1. Sometimes we don’t always get what we want when we want it, so be patient. This is probably the most difficult option since most people aren’t naturally patient, myself included. But, sometimes this is what it takes when certain factors aren’t within your control. All you can do are the things within your control. For instance, when doing a job search you can build your network, learn how to market your skills and strengths, conduct informational interviews, apply for jobs, and prepare for job interviews. After that, it’s out of your hands. You have to be patient while the seeds you’ve sown grow into the right opportunity. 2. Make the best of your current situation. Maybe you can’t change your situation right now. But you can change some things about it to make the best of it until another opportunity comes your way. Check out my post How to Make Your Sucky Job More Bearable (Until You Can Leave). 3. Just enjoy and be content with and grateful for the beauty of your current place or situation because things will soon change for the better. Often my clients are in a period of transition which feels uncomfortable for them. I too have been in that same situation. Instead of letting it continue to frustrate me, I chose to make the most of that time by learning some new things and doing some really fun, awesome things as well. I learned to relish that time because I knew it was a rare opportunity to do so. That’s why I encourage my clients to relish periods of transition despite the uncertainty they’re facing. The ones who do, are so glad they did, and the ones who don’t, often regret it. 4. Wait to make your move until conditions are more favorable. You might have more control than you think. But, you have to make sure you’re taking action in both a timely and responsible way. When I first started my business, I didn’t immediately leave my full-time job with benefits. Instead, I started taking small steps toward my goal before taking a leap of faith. To learn how to make a career risk doable, read my post How to Make the Risk of Starting Your Own Business Doable. 5. Pay attention to the warning flags. Just like I had to pay attention to the beach’s warning flags, you also have to look at the warning flags in your career. For example, are you hearing rumors of potential layoffs at your company? Is your job at risk of being replaced by the latest technology? To know how to best prepare for such a situation, check out my post Want More Job Security? Do This One Simple Thing and also click on the related posts for even more tips. 6. You’ll keep going in circles if you don’t step out of your comfort zone. Once you’ve done some or all of the above, there eventually comes a time when you have to step out of your comfort zone and take a leap of faith. How do you do that? Click here to find out. 7. Don’t wait for an opportunity to come open. Make your own opportunity. Sometimes you have to take the bull by the horns and make things happen for your career. This could mean combining some of your skills and passions to start your own business. Or it could mean proposing a new or different role for you at your current company that better incorporates your strengths and interests, therefore improving the company’s bottom line. A real win-win! The trick is knowing which option to choose at which time. In one of my own career trappings, I waited patiently for the conditions to be right to make my exit and spent that time wisely planning my course of action. In another situation, I took a leap of faith. Both coping mechanisms worked for me in those particular situations. But they probably would’ve failed had I taken a leap of faith when it was too early, or had I waited around when I should’ve taken action. Sometimes it can be difficult to know which option to choose. And even then it can be difficult to know the best timing for your chosen option. A good career coach can help you determine both. What’s causing you to feel trapped in your career right now? Which option above is speaking to you? I invite you to share in the comment box below. I also invite you to start setting some goals that support the option (or options) that works best for you at this time. Learn how to do so by subscribing to my newsletter and receiving a complimentary download of the 8-Step Goal-Achievement Plan.